Business, construction and development leaders in Appalachia are rallying in support of AEP’s plan to build the largest solar farm in Ohio history. The Public Utilities Commission of Ohio held its first public hearing on AEP Ohio’s plan to build two significant solar farms in Highland County: Highland Solar Farm, which would come in at 300 megawatts, and Willowbrook Solar Farm, at 100 megawatts. If completed, the former would become the state’s largest solar farm. In a standing-room-only meeting, economic development leaders said the project could see economic investment in a part of the state that was just this year racked by the closure of two coal-fired power plants. About 50 residents and community groups spoke during the meeting Tuesday morning. AEP says the construction of these facilities would bring $24 million in new state tax revenue and $6.7 million in local tax revenue, with Ohio materials preferred to source the project. Construction also would support 4,000 jobs, including 113 permanent manufacturing jobs in the solar supply chain. The utility, which serves 1.3 million residential and 200,000 commercial customers in the state, says it plans to develop 900 megawatts of renewable energy production in the state as part of $33 billion in infrastructure work. 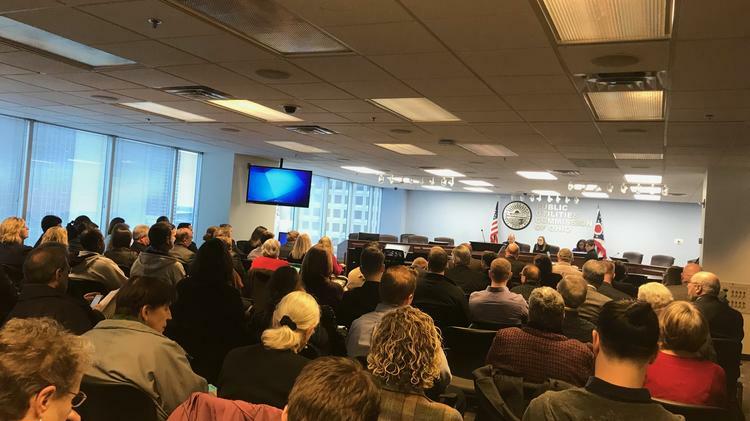 In a standing-room-only PUCO meeting, economic development leaders said the project could see economic investment in a part of the state that was just this year racked by the closure of two coal-fired power plants. I was at the PUCO hearing yesterday about the AEP solar farm proposal. If I had known it would get so much press I might not have gone. There was no opposition expressed. All the comments were in support of jobs, investment, tax revenue, and renewable energy. If it had been a fracking discussion the only difference would have been the energy technology being supported. Appalachia is really in bad shape! Perhaps there is an opportunity for increasing residential solar in Appalachia as the result of AEP’s project. The next hearing is scheduled for Jan 15th. Actual PUCO discussion of the solar project will be later in the spring. I’m really glad I went to this one. The Ohio Consumer Council had a handout explaining that AEP is trying to pull a fast one by owning the proposed generating facility. I’ve attached the pdf version of that handout. One of the first things Kasich did as governor was to cut the OCC budget by half. in accordance with customer demand. power plant market as AEP proposes. power plants if needed by consumers. (less likely) from these transactions. (with private not utility funding). Tuesday, December 4, 2018 at 10:00 a.m.
Customers can also write the PUCO. ·  Practice in front of family or friends. What happens when – in the name of combating climate change – gigantic, industrial-sized renewable energy projects are thrust upon unsuspecting rural communities whose residents soon find out that these unsightly monstrosities destroy vegetation and wildlife, pollute rivers, streams and groundwater, and lead to higher electricity prices for families and businesses, as well as lower property values for nearby residents? Local residents fight back, that’s what. Spotsylvania County, Virginia lies about halfway between Washington, DC and Richmond. Although the county, located along the busy I-95 corridor, has seen its population grow fourfold since 1980, to about 135,000, its over 400 square miles are still home to picturesque woods, lakes, rivers, streams, Civil War battlefields, and productive farmland. It is in this world that Utah-based Sustainable Power Group, also known as sPower, wants to construct the largest solar complex east of the Mississippi River and the fifth-largest solar facility in the nation. The other four mega-solar projects are located in the sparsely populated desert Southwest. How gargantuan will Spotsylvania’s facility be? SPower plans to install nearly 2 million solar panels on 3,500 acres of land, or about 5 ½ square miles. All told, the project will encompass 6,350 acres, with some 2,000 set aside for preservation. How “Green” is the Project? Thousands of acres of trees have already been cleared to make way for the solar arrays. Like industrial-size wind installations, solar arrays are both land-intensive and intermittent. The Spotsylvania project will require a source of backup energy when the sun doesn’t shine. But battery backup brings its own environmental problems. Batteries degrade over time, and the maintenance and eventual disposal of the thousands of batteries, all laden with toxic chemicals, needed to back up the project’s 1.8 million solar panels raises questions about how “green” the project really is. Local residents, who have united to form Concerned Citizens of Spotsylvania, are worried about such things as erosion, water usage at the site, toxic materials in the solar panels and the backup batteries, the potential for fires, and how to handle decommission of equipment in the event the project is cancelled. These citizens turned activists, who do not want to see their communities sacrificed on the alter of someone else’s notion of “clean energy,” are pressing county officials to reject the project. Little, if any, of the electricity generated at the complex would go to local residents; instead, purchasing the power would be the likes of Apple, Microsoft, Akamai, Etsy, and the University of Richmond. Deep-pocketed tech giants are not just interested in virtue-signaling their solemn commitment to “clean” energy. Many of them have electricity-hungry data centers in nearby Ashburn, Va., the nation’s leading location for data centers serving the Internet. That sPower’s Spotsylvania installation would wreak havoc on local communities and the environment is of little concern to well-connected out-of-state interests. The 500-megawatt project was approved by Virginia’s State Corporation Commission last August but must still clear addition hurdles, including receiving special use permits from the Spotsylvania County Board of Supervisors. SPower hopes to have the facility up and running by mid-2020. While sPower, the tech companies that would buy the electricity, and the facility’s supporters say the county will benefit from the giant solar power plant, others argue that county tax revenues will actually decline if the project goes forward. Real estate agents in the area are warning that property values could fall from 5 to 20%. If the tech companies want power for their data centers, there is plenty available at affordable rates. Most electricity in Virginia now comes from natural gas, a baseline fuel source that is reliable, affordable, and not nearly as environmentally and aesthetically disruptive as the proposed solar project.